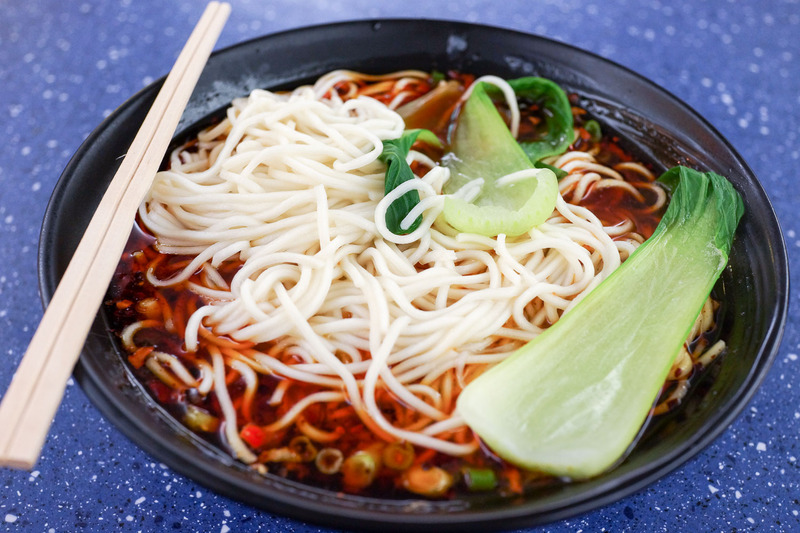 Chongqing style food strikes into Eating World, bringing a world of spicy noodles, twice cooked pork and hot and sour soups with it. And a touch of very fragrant intestines. 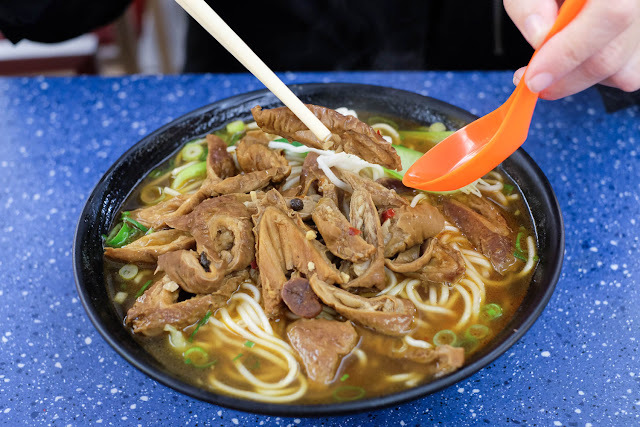 Replacing the oldest stall in Eating World is noodle purveyor: ChongQing No 1. 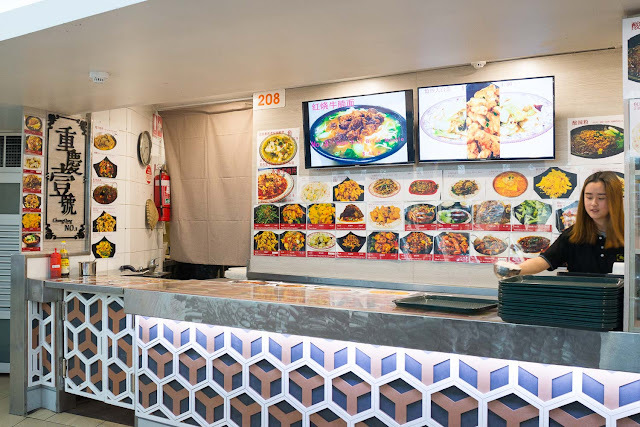 The menu has a few general Chinese style dishes that will be recognisable to most but tucked in around the edges are some spicy numbers worth a bite. We start off with an old favourite - twice cooked pork ($11.50) - stir fried pork with veggies in chilli'n'oil - a must for all swine fans. 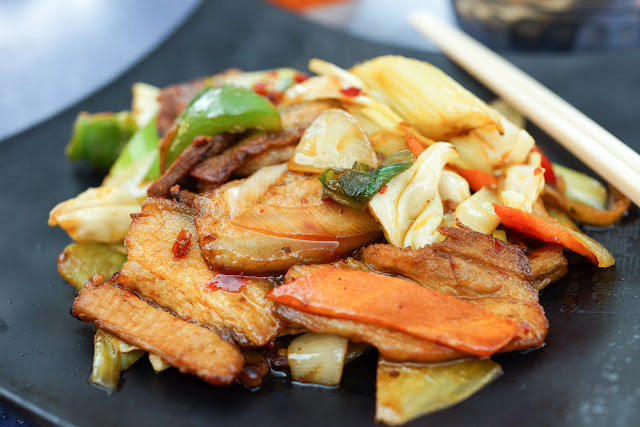 Roast pork is sliced thinly and recooked as part of a stir fry with a good serve of vegetables. This has a spicy bite and a lovely smokiness to it. Chong Qing Noodles - $7.50. We've developed quite a love for this dish of late - thin noodles in a spicy chili garlic-y Sichuan peppery broth. A big serve too. It's #1 on the menu and rightly so, highly recommended. Hot and Sour Vermicelli - $7.80. This noodle variation is made with clear vermicelli noodles in a spicy chilli broth that has a little bit of additional vinegar sourness. Crunch factor supplied by small roasted soy beans. 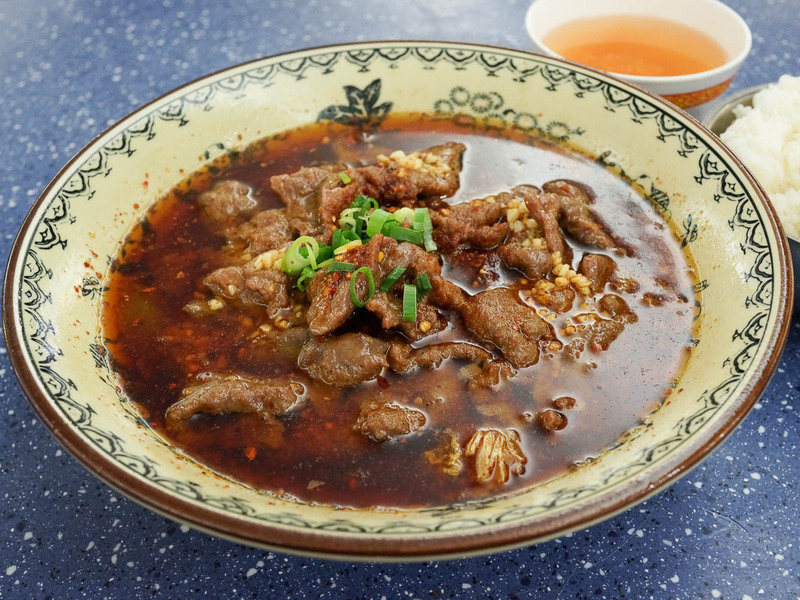 ...but this dish is all about the beef which is soft and tender, made super delicious by that spicy broth. The dish comes with chopsticks and no spoon which tells us the not to drink the broth (burnies! 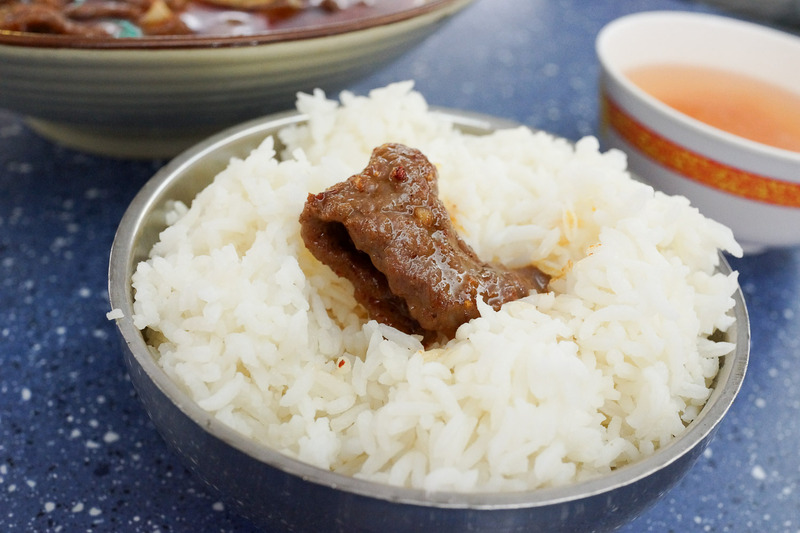 ), just pick out the beef bits one by one - a nice dish to slowly enjoy while reading a book or having a chat, there's easily enough beef for two. 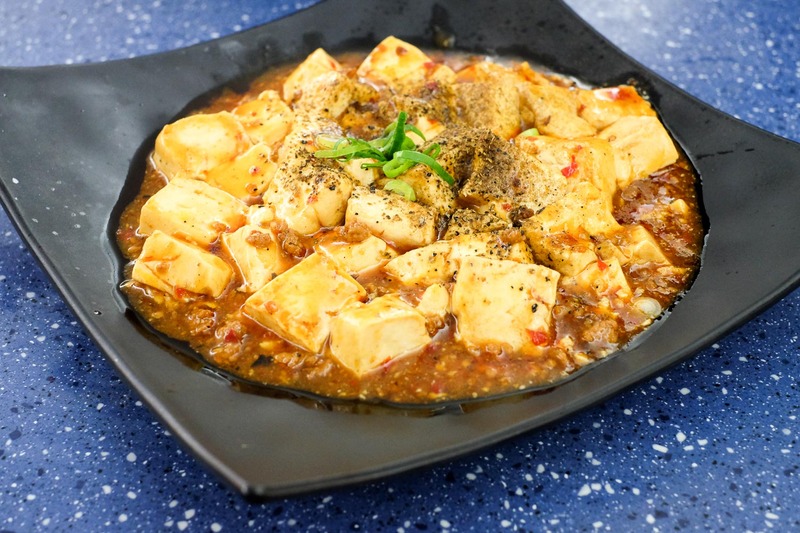 Mapo tofu - about $10. A good spicy version of this classic pork'n'tofu number with plenty of tongue tingly Sichuan pepper. Beef intestine noodle - $11.80. For fans of the French tripe sausage andouillette, this bowl has all the same olfactory pleasure as breaking open those notorious sausages of stinky delight. The intestine serve is generous, the noodles same. Stew potato - $4.80. 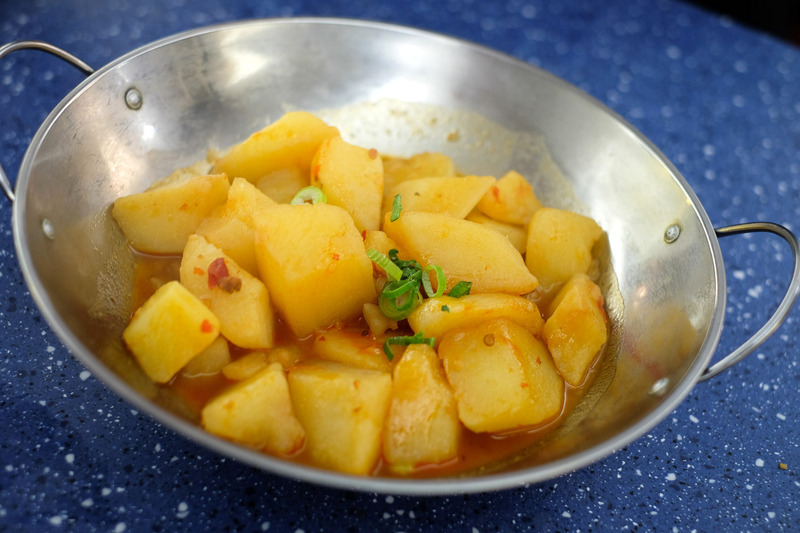 A gentle and filling side dish. We are often thinking up ways you could eat for as little as possible in the food court, we reckon a bowl of this and a plate of steamed greens and rice and you'd be set for under $10. ChongQing No 1 is at the end of Eating World in the opposite corner to Gumshara, 25-29 Dixon St, Haymarket in Chinatown.